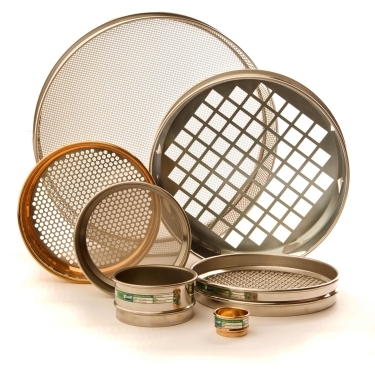 Endecotts woven wire mesh sieves are the most widely used test sieves for all types of laboratory sampling and particle size analysis . They are made with only the highest quality materials and are available in diameter sizes of 38, 100, 150, 200, 250, 300, 315, 350, 400 and 450mm or in 3, 8, 12 or 18 inches. Half Height Sieves - Where smaller quantities of samples are being analysed half height sieves are often used. These are available in diameters of 100, 200 or 300mm and 3, 8 or 12 inches with the complete range of woven wire mesh or perforated sieving mediums. Microplate Sieves - For very fine particle ananlysis Endecotts produce a range of microplate sieves made from electro-etched nickel plate in stainless steel frames of 100mm diameter. Available with unique self clearing aperture sizes from 75 to 5 microns. Wet Washing Sieves - Extremely useful sieves where samples need to be separated with the help of wet washing. Available in 8 inch diameter by 4 or 8 inches deep or their metric equivalent with brass or stainless steel frames. A complete range of aperture sizes with optional support medium for fine mesh. Extra Depth Sieves - Extensively used by the construction and cement industries. These exta depth sieves are available with a diameter size of 450mm and a depth of 300mm. Made from plated steel with woven wire mesh or perforated plate sieving mediums.